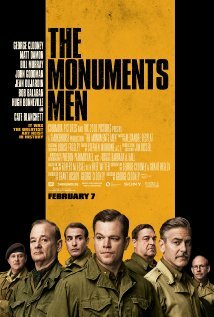 The “art experts” (George Clooney, Matt Damon, Bill Murray, Jean Dujardin, Bob Balaban, John Goodman, Hugh Bonneville), labeled “the Monuments Men,” are museum curators, academics and architects. They get into some harrowing situations but remain jaunty and optimistic. They believe they are on a divine mission to save the culture of the world that Hitler wants to destroy, or at least steal. As is emphasized throughout the movie, when people are wiped out, they will return little by little, but when their heritage and their culture are gone, there is no way it can be restored. Cate Blanchette plays a French woman working for the Nazis in Paris who aids the Monuments Men by giving them detailed records she has kept of the stolen artworks. The Monuments Men is based on a true story. It has an old-fashioned feel, aided greatly by the retro-sounding music score, and is definitely “light” entertainment. If you see it today, you’ll probably enjoy it but you might forget all about it by the end of the week.